This auction created a lot of interest with 36 bids up to $4,198.32, and I have read that serious collectors were ready and willing to pay upwards of $9000. A thread in an Elvis forum, FECC, covered this auction until it prematurely ended. The seller, twotenmedia, is no longer an eBay registered user. This is a record that has been suggested to exist, however never confirmed. Please note that the record labels are from the eBay auction, they have been reformatted slightly to display better, that is the reason for the identical background for the record sleeve. Concerns have been raised over the legitamacy of this record. It looks like the seller has simply copied the format of the RCA 45's issued by Decca in those years but has omitted a few items: i) The US Catalogue number which Decca always put in small print on their RCA singles, ii) the matrix number is nowhere to be found (all of my UK 45's have the matrix number on the label), iii) the notation "Recording first published 1960" is nowhere to be found (this notation was standard on all UK singles of the era). 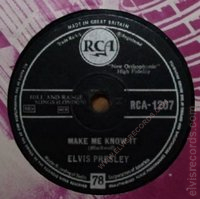 In addition to the missing items on the lablel, I believe that the last Elvis single issued on 78 by Decca on the RCA label in the UK was "A Mess of Blues" backed with "The Girl of My Best Friend". 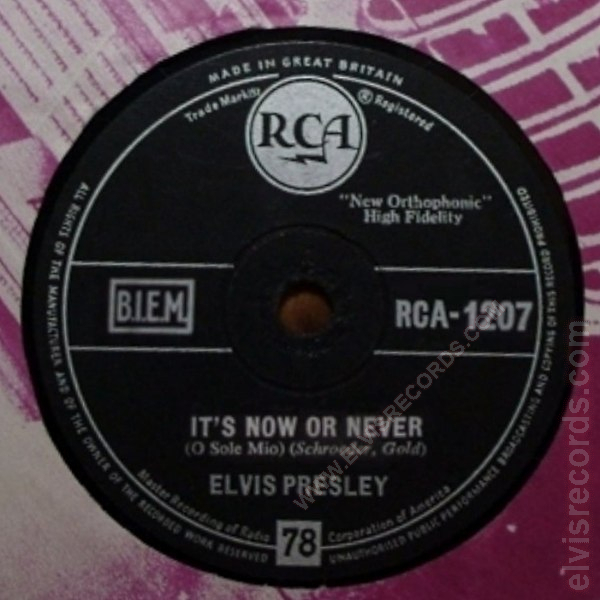 The release of "It's Now or Never" in the UK was delayed by copyright issues, so Decca released "A Mess of Blues" as an A-side and took the above-mentioned song off the Elvis is Back album and put it on the B-Side. 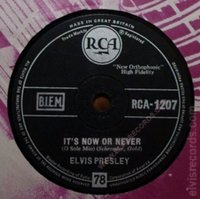 When the copyright issues were resolved, Decca released "It's Now or Never" on 45-RCA-1207 with another song from the "Elvis is Back" album: viz. "Make Me Know It". Now for the copyright issue that held up the UK release of "It's Now or Never". Since "O Sole Mio" was not in the public domain under UK copyright law, the original composer, Eduardo di Capua, had to be listed on the label. When the record was finally released in late 1960, Mr. di Capua's name was listed. It is doubtful that the reference to O Sole Mio shown on the label would have satisfied the copyright issue. Attempts to confirm the authenticity of this eBay listing have come wihout fruition. Elvis: IT'S NOW OR NEVER / MAKE ME KNOW IT RCA 1207 Old 78rpm record. UK 78 in Capitol sleeve. Record is on the RCA label. I don't have a 78 player but it looks to be in pretty good condition - the record is still shiny and there are a few light marks but no scratches. I am sure it will play well. I also have listed a HMV "Hound Dog" 78. I understand how fragile 78's are, so this will be very well packaged. POSTAGE 4.00 UK / 6.00 elsewhere. PAYPAL preffered but will also accept UK Cheque. Any questions, please ask! !